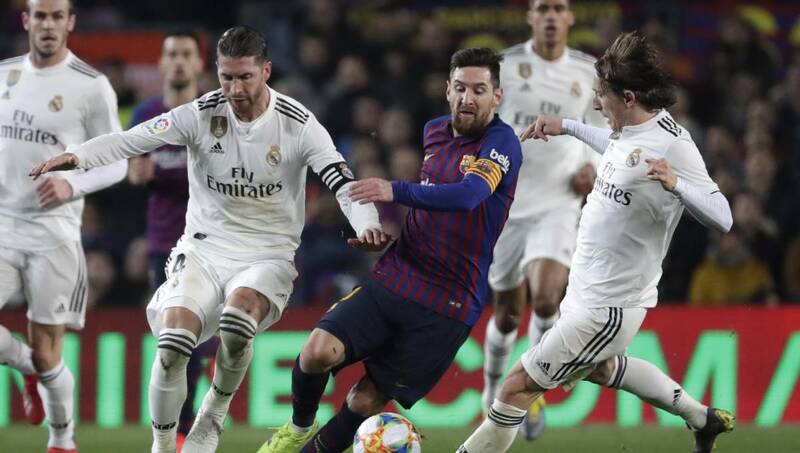 Photo: Barcelona forward Lionel Messi, center, Real defender Sergio Ramos, left, and Real midfielder Luka Modric, right, vie for the ball during the Copa del Rey semifinal first leg soccer match between FC Barcelona and Real Madrid at the Camp Nou stadium in Barcelona, Spain, Wednesday Feb. 6, 2019. Zurich, Feb 9 : FIFA is moving from London to have a night at the opera in Milan to honor the world’s best players and coaches. London has hosted the Best Awards for the past two years after FIFA’s new leadership moved the event from long-time home Zurich. Croatia midfielder Luka Modric was voted the 2018 best player. FIFA’s top management has deep connections to Milan and its storied clubs. The world soccer body’s president, Gianni Infantino, is an Inter Milan fan, and deputy secretary general for soccer, Zvonimir Boban, played at AC Milan and won a Champions League title with the club.